(Charles Rex Arbogast/Associated Press ) Economist and author Steven Levitt. Four years ago, “Freakonomics” took the reading world by storm. Co-written by the acclaimed economist Steven Levitt and the journalist Stephen Dubner, the book pulled off the unlikely coup of recasting economics, the theretofore dismal science, as a tool for cerebral swashbucklers. The writers explored the finances of drug dealers, the workings of the Ku Klux Klan, the incidence of cheating in the sumo ring. They argued that legalizing abortion cut crime in America, and they traced the economic factors that drove baby-name fads. With the wide-roaming intellect of Levitt and the droll, clear writing style of Dubner, the book was a smash, selling 4 million copies. Over and over, the book highlighted the ways that ruthlessly discarding our comforting biases and folk wisdom and replacing them with the habits of cold-eyed empiricism could reveal “the hidden side of everything.” Dubner and Levitt laid out a sort of freakonomics credo: Conventional wisdom is often wrong, so-called experts abuse their authority but can be outsmarted by savvy amateurs, and, most important of all, the right data, properly crunched, can solve even the most seemingly insoluble questions. Now Dubner and Levitt are at it again, marshalling the forces of data to trouble the conventional wisdom and dethrone the experts. In their new book, “SuperFreakonomics,” they argue that walking drunk is more dangerous than driving drunk, that a doctor’s skill doesn’t matter very much, and that prostitution makes poor women better off. But the book’s biggest provocation comes in its last chapter, on climate change. And it has ensured that, unlike the last time around, the new book is being greeted with as much outrage as curiosity. The “SuperFreakonomics” treatment of climate change, critics charge, is a hodgepodge of unfounded and occasionally contradictory claims. Time and again, the critics say, Dubner and Levitt raise provocative, if unoriginal, arguments only to move on to the next provocation without bothering to mention substantial, even overwhelming, evidence to the contrary. Among other things, readers are told that solar power contributes to global warming, that the climate models that predict warming have all been doctored to achieve matching results, and that carbon dioxide does not “necessarily” warm the earth and may have had little to do with recent warming trends - all arguments that the majority of climate scientists reject as wrong. What’s more, some of the researchers Dubner and Levitt cite charge them with mischaracterizing their research. In short, the authors’ critics charge them with letting their own particular bias - for clever and scandalously counterintuitive answers to big questions - blind them to the weight of the evidence. For their part, Levitt and Dubner dismiss the attacks as over-the-top and ideological - Levitt has called the book’s critics “the carbon crazies.” The authors strongly defend their use of the available research and argue that the criticisms focus on what are essentially a few bad wording choices. They characterize the controversy as a cautionary tale about the speed and free-floating vitriol of the blogosphere, where many of the attacks on the book have been written and amplified. Both Dubner and Levitt emphasize that they are deeply concerned about climate change and just want to encourage hardheaded, imaginative thinking about how to solve it. “If you’re the kind of person who, for political or personal or ideological reasons, is primed to dislike the economic and scientific arguments in the chapter, then of course that’s going to make you argumentative,” says Dubner. Levitt is no stranger to controversy. From an early age, he seems to have had a penchant for provocation: In a recent talk at New York City’s Symphony Space he described how, as a high school student, he gave a speech to the entire student body on “the lighter side of AIDS.” His best-known paper remains a 2001 study he co-wrote with John Donohue of Yale Law School arguing that Roe v. Wade, by reducing the number of unwanted children born to poor mothers in the 1970s, reduced the number of maladjusted teenagers roaming the streets in the 1990s and caused much of that decade’s drop in crime. The finding provoked outrage all along the political spectrum. If he were merely an intellectual bomb-thrower, though, Levitt would not have gained the stature he enjoys in his field. A professor in the storied University of Chicago economics department, he has, despite doing the ostensibly oddball research “Freakonomics” describes, earned a reputation as one of the brightest economists of his generation. In 2003 he was awarded the John Bates Clark Medal, a then-biennial prize given to the best American economist under the age of 40. That same year, Dubner, a writer and former editor at The New York Times Magazine, wrote a profile of Levitt in the pages of that magazine which became the germ of their first book. “Freakonomics” did have a few detractors when it was first published. The finance blogger Felix Salmon wrote a long, critical post about the book at the time, complaining, among other things, about what he saw as the authors’ preference for eye-popping statistics over realistic ones. As the book grew more popular, a few economists publicly worried that Levitt’s example was triggering a faddish interest among economic thinkers in cute questions rather than important ones. Still, the book’s reviews were overwhelmingly positive, and its success inspired a rash of economists to try their hand at writing books offering to help the rest of the world think like them. 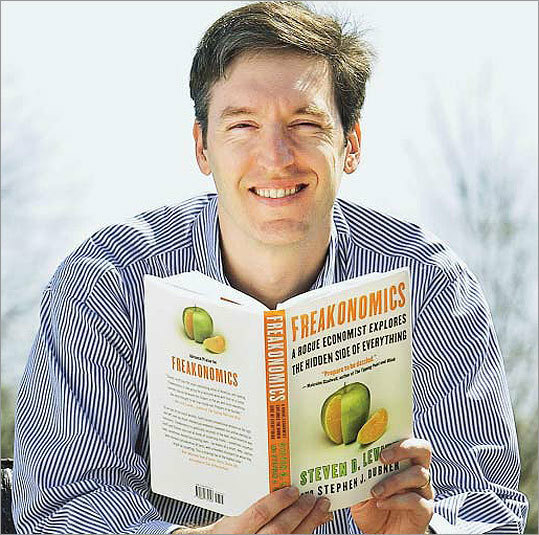 Much of the material in both Freakonomics books is based on Levitt’s academic research. The climate-change chapter, however, is not. According to Levitt, the decision to write about the topic grew out of his and Dubner’s conviction that it was a perfect target. “One of the basic principles is that we try to look at conventional wisdom and see places where we think it doesn’t reflect reality very effectively,” he says. The more they studied climate change, the more they decided that was the case. But the chapter ended up being prescriptive, as well: It is, in essence, a long pitch for responding to climate change with the aggressive manipulation of the atmosphere - so-called geoengineering - rather than the slower and far more expensive carbon-mitigation efforts that many environmentalists favor. The centerpiece of the chapter is a presentation Dubner and Levitt attend at an “invention capital” firm called Intellectual Ventures, or IV, in Bellevue, Wash., where the assembled scientists and inventors discuss global-cooling geoengineering schemes, like an 18-mile-long hose to pump sulfur dioxide into the upper atmosphere and a fleet of underwater turbines to create salt-spray clouds over the oceans. Along the way, the authors explain the economics of LoJack and the difficulty of getting doctors to wash their hands, and every few pages there is another conventional wisdom-exploding salvo, often calling into question the reliability of current predictions of global warming or questioning the role that carbon dioxide plays in it. The book’s critics range from environmental activists and opinion journalists to climate scientists and liberal economists like Paul Krugman and UC Berkeley’s Brad DeLong. Some attack the book for bringing up geoengineering at all, arguing that the idea is a nonstarter - though a few prominent climate scientists have begun to argue for at least researching its potential. Most, though, focus on the way Dubner and Levitt have made their case, accusing them of a multitude of scientific, economic, and journalistic offenses. Their arguments, critics say, are characterized by a combination of non sequitur - the authors carefully explain, for example, that carbon dioxide is not poisonous to breathe - misrepresented data, passing off discredited claims as new ideas, and ignoring evidence that challenges their counterintuitive claims. The greatest heat, on both sides, has been generated by accusations of misrepresentation. Joe Romm, a physicist and influential climate blogger, exposed one instance in a post he put up a week before the book’s publication that effectively launched the broader attack on the book. The instance involved Ken Caldeira, a leading atmospheric scientist and a researcher at the Carnegie Institution for Science who has become a proponent of geoengineering research. Caldeira was at the IV meeting that Dubner and Levitt attended, and the authors paraphrase him saying, “carbon dioxide is not the right villain in this fight.” According to Caldeira, that is exactly the opposite of what he thinks - he believes and has publicly argued that carbon emissions are an enormous problem and that geoengineering only makes sense in concert with radical emissions reductions. “That has no basis in what I said,” he says. In response, Dubner has conceded that the passage may mislead readers. But he points out that, like the other IV team members, Caldeira had a chance to review the chapter before publication. He raised concerns about the passage then, and while another mitigating passage was added, the original one was not removed, and Caldeira partially blames himself for not being more insistent about it. If atmospheric carbon dioxide rose only after a rise in global temperature, it would indeed strongly suggest that carbon dioxide has no effect on global temperature. But what Severinghaus found in the ice core data was that atmospheric carbon dioxide began to rise during the warming that followed an ice age, an average of 800 years into what is a 5,000-year warming period. Severinghaus points to climate models that suggest that the carbon dioxide, released from the world’s oceans as they warmed, had strong warming effects as it accumulated in the air over the following 4,200 years. Asked over e-mail about the use of Severinghaus’s research, Levitt responded, “The sentence may be poorly written, but I do not think it is factually inaccurate.” He also defended the citation on the grounds that, while Severinghaus may not think his finding supports their point, it does not clearly disprove it, either. “Severinghaus says that this is not definitive evidence against CO2 warming the earth; he certainly can’t argue that this is definitive evidence that CO2 does warm the earth,” Levitt wrote. Dubner and Levitt’s larger argument is that the uncertainties inherent in climate science make the case for geoengineering - a solution that is, they argue, cheap, fast, and reversible - all the stronger. Sometimes they make the case in actual arguments, sometimes simply with asides. At the close of one section, they mention the “little-known fact” that average global temperature has decreased in recent years. This is true, at least according to one of the two major sets of temperature data. Dubner and Levitt don’t always raise criticisms about the consensus view of climate change in their own voice. They quote, for example, the scientists and inventors they talked to at IV making similar arguments. Lowell Wood, an astrophysicist, says, for example, that climate models are unreliable because they can’t handle water vapor, and that they only seem reliable because modelers are actively manipulating them to get the results they want. IV’s founder, Nathan Myhrvold, a physicist and former head of research at Microsoft, is quoted arguing that building and running solar arrays would actually make global warming worse over the short term, and that most of the warming of the past few decades might actually have been caused by cleaning up the atmosphere. (IV didn’t make Wood available for comment, and a spokesman said Myhrvold was traveling and unable to be interviewed). These are extremely controversial statements, and according to many climate scientists, flatly wrong. Dubner and Levitt, however, present them without including the responses that climate scientists - and environmental economists - have offered in the past when similar points have been made by global warming skeptics. “One of things that they do in this chapter is try to frame this as them versus the environmentalists, to say, ‘We’ve got the scientists on our side, and you’ve got Al Gore’,” says Romm. But, he argues, climate scientists familiar with the book see Dubner and Levitt as gravely mischaracterizing the state of the science. And even fellow proponents of geoengineering research have piled on, arguing that Dubner and Levitt do the cause few favors by associating it with fringe arguments. Asked why they didn’t mention any of the rebuttals that others have offered up to the arguments in “SuperFreakonomics,” Dubner says, “I think that’s a very legitimate question. And the reason they’re not rebutted is because they are rebuttals to the conventional wisdom.” The conventional wisdom, in other words, can take care of itself. For their critics, this attitude is exactly the problem. In climate change, as in many other realms, the conventional wisdom can be ossified and oversimplified, but at the broadest level there is actual evidence to support it. And the way the conventional wisdom is wrong is often not something that makes for an eye-catching title but something that belongs instead in the fine print.